Credit: David Ishikawa licensed under . For the Japanese, Shibuya is synonymous with young people. Thanks to its many malls, shopping streets, bars, restaurants, izakaya, clubs and concert halls, it attracts masses of people every night and weekend that come to enjoy themselves. But once you move away from Shibuya’s overcrowded scramble crossing, one of Tokyo’s most diverse and impressive neighbourhoods unfolds. Besides the bustling area around Shibuya Station, the ward has many quieter corners. Shinsen and Ikejiri, both within minutes from Shibuya Station, are upscale residential neighborhoods popular with expats and young Japanese families. The vast Yoyogi Park and Meiji Shrine form the green heart of Shibuya City. Smaller parks and shrines are dotted throughout the ward. Its general image as the fashion central of Japan repeats itself in the more local areas of Shibuya as well. Daikanyama is a fashionable neighbourhood with a more exclusive vibe while the area around Ebisu is known for its great dining options. Hiroo is another popular area with the Tokyo expat community where a renowned international school, one of Tokyo’s biggest international supermarkets, international clinics, embassies, and a great selection of restaurants and cafes can be found. It is easy to see why foreigners and Japanese alike appreciate the convenience of having everything at your fingertips while being in one of the city’s most central (but also priciest) locations. Shibuya is a comparatively small ward of 15.11 km2. It is one of Tokyo’s C5W, the five central wards. It is bordered by Shinjuku ward to the north, Meguro ward to the south, Setagaya ward, a popular residential area, to the west, and Minato ward to the east. It has a foreign population of just under 5% with 10,458 of a total of 225,717 inhabitants. The population density is lower than many of its neighbouring wards with 15,200 people per square kilometre, but the ward is well visited by commuters, shoppers and diners, so expect things to get crowded, especially on weekends. The average age of its residents is 43.99 years, making it one of the youngest of Tokyo’s 23 wards. Shibuya offers some of the best choices in shopping, dining, schools and hospitals in Japan. The area around Shibuya Station is popular with young shoppers. They flock to the iconic 109 Mall for (young) women’s fashion. The newer Hikarie Mall on the other side of the station is another popular destination. Tokyu and Seibu department stores stock high-end Western brands and designer fashion. Omotesando Boulevard is lined with flagship stores of almost every big name fashion designer. It is located just a few minutes' walk from Harajuku Station where street fashion dominates. Smaller up-and-coming labels can be found in the trendy Daikanyama area. Daikanyama is also renowned for its high-end dining options. The other foodie haven in Shibuya is located around Ebisu Station. Tokyo’s most popular international supermarket, National Azabu, is located in Shibuya Ward, close to Hiroo Station. Seijo Ishii and Kaldi Coffee Farm, two chains of smaller international supermarkets, operate several branches in the district as well. Both the Tokyo Metropolitan Hiroo Hospital and the Japan Red Cross Medical Center have English-speaking physicians on duty. Shibuya has one of the best selections of gyms and fitness clubs in Tokyo. The popular international fitness club Gold’s Gym has three branches, in Omotesando, Harajuku and Yoyogi Uehara. The 24-hour chain Anytime Fitness operates many branches and other big Japanese chains like Konami and Tipness are represented in several locations. Many of Tokyo’s international schools are located in Shibuya ward. The British School in Tokyo (co-ed), International School of the Sacred Heart (girls) and Elite Open School (co-ed) are all centrally located here. Shibuya also has a number of international pre-schools and elementary schools. Major stations in the ward are Shibuya, Ebisu, Harajuku, Daikanyama, Hiroo, Sendagaya and Yoyogi Station. Yoyogi, Harajuku, Shibuya and Ebisu are located next to each other on the Yamanote Line, making them extremely convenient for commuters. From Shibuya, it takes around seven minutes to Shinjuku and 20 minutes to Tokyo Station. The Narita Express offers a direct connection from Shibuya to the airport and takes around an hour. To Haneda Airport, it is around 40 minutes with a transfer. Sendagaya Station is centrally located on the Chuo Line, making it another sensible option with similar commute times. Hiroo and Daikanyama are located on smaller subway lines, which often adds an extra transfer to commutes, but also means the areas are quieter and less crowded. Add 10 to 15 minutes in commute for those stations. Shibuya City is one of Tokyo’s most desirable residential neighbourhoods. New properties up to five years old sell for JPY 1,500,000/m2 on average, making it the second most expensive area, exceeded only by Minato ward. Older buildings become more affordable, with 10-year-old properties selling for JPY 1,360,000, 20-year-old buildings for JPY 1,110,000, and 30-year-old buildings finally falling under the 1-million mark at JPY 950,000/m2. Unsurprisingly, Shibuya is also one of the most expensive areas to rent. 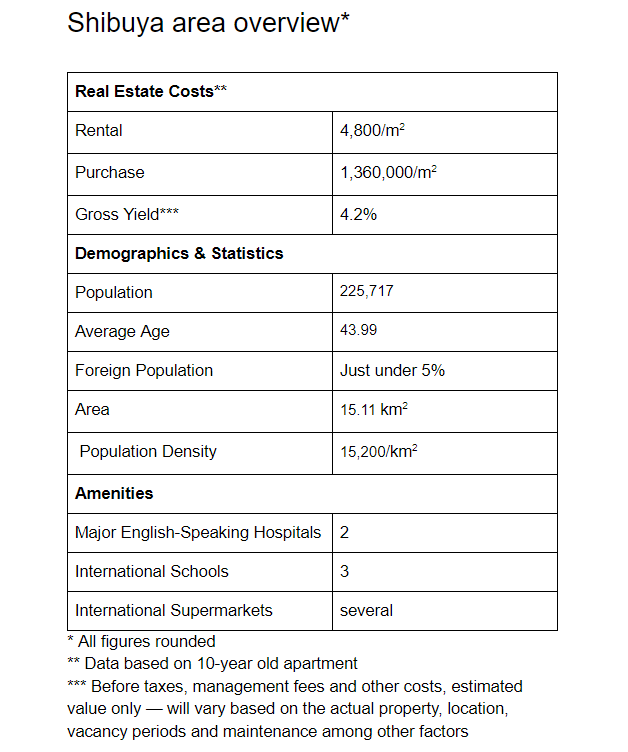 Again, only exceeded by Minato ward, rent per square metre in a brand new property sets you back JPY 5,200 on average. Those that don't mind older buildings can save considerably on their rent. Ten-year-old buildings go for JPY 4,800, 20-year-old ones for JPY 4,250, and 30-year-old buildings for JPY 3,850 per square meter on average. ROI in the C5W tends to be lower than what can be achieved in outer wards. At the same time, vacancy risk might also be lower due to the popularity of central areas like Shibuya. On average, one can expect a gross annual return of just over 4% for a new building and over 4.6% for property around 20 years old that still would have a considerable lifespan before facing demolition.